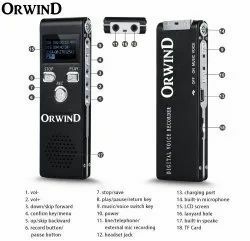 Orwind.In*OVERVIEW*- ORWIND DIGISOUND+ Portable Mini Pocket Size Digital AudioRecorder With Continous 22 Hours & Long Lasting Ulttra Clear Recording Upto 65Metres(4GB/8GB/16GB Models)*Key Features*:★-STEREO RECORDING: Omni-directional sensitive stereo microphones to securely capture every sound and voice, whetherrecording from your pocket or anywhere else, only 4" x 1" x 1/2" compact size★-ONE-TOUCH RECORDING: Thanks to the REC slide switch, you can silently and quickly activate the recording with one-touch inyour pocket (power on before), without making the other party self-conscious★-VOICE ACTIVATED RECORDING: VOR function only records as there is sound and is on stand by with no sound. HI/LO sensitivity isconfigurable. Indicator light could be turned off for incognito operation★-SUPER-LONG RECORDING TIME: 8GB/16GB internal memory, up to 270 hours of recording time, impressive 22 hours of batterylife, capture notes, lectures, conferences, meetings, dictations and store documents★-INTELLIGENT FUNCTIONS: Digital voice recorder, MP3 player, recording monitoring, telephone recording, forward or rewind, 20levels volume adjustment, erase function, backlit LCD screen, bulit-in speaker, time and date stampDESCRIPTION: Ultra portable voice recorder | Built-in flash memory, Support a key recording function, in any interface,press the record button to record. | A key voice playback, press the main menu under the fast and fast voice, playback of audio filesdirectly. | A key noise reduction recording function. | A key recording segmentation, simple operation.| AGC recording function. |A / B / C three recording folder. | Support TF expansion card function(Upto 64GB). | Support recording time stamp function, beforeyou use the recording, set the current time firstly in the settings. | Support voice, monitor, timer recording function. | Music /recording / setting three modes switch. | 32Kbps, 64Kbps, 128Kbps, 192Kbps, 512Kbps, 768Kbps, 1024Kbps and 1536Kbps eightrecording quality choices, the recording settings can be selected, (the default is 512Kbps quality). | Precise alarm clock, stopwatch,calendar function. | Eight sound modes: Off (Nature), Rock, Funk, Hippop, Jazz, Classical, Electronic, Custom, etc. | Timingshutdown setting function is more convenient to use. | MP3, WAV two format recording; | Two-channel stereo recording. | Filemanagement: This machine comes with file delete function. | You can select A-B to repeat between two time points. | Free drive Udisk function, WIN98 above system free drive, USB2.0 common interface, high-speed data transmission. | Support built-in /external microphone (capacitive) recording. 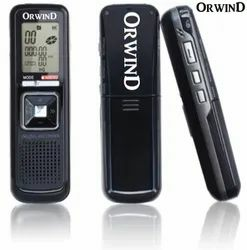 =AUDIO / VOICE RECORDERS& SECURITY EQUIPMENTS=Contact: +91-7777-001500 | Store: IndiaBoosters.com / Orwind.In*OVERVIEW*- ORWIND PLAYNOW+ Digital Voice Recorder -Audio Sound Recorder MP3 Player 320Kbps Dictaphone, 4GB/8GB DoubleMicrophone, Voice Activated Recorder for Lecture, Meeting, Spy - Auto SavingRecorder*Key Features*:¿¿¿-MP3 Player¿¿¿Not only a voice recorder, also it can be used as a MP3 player, come with mini USB port, it is easy toupload and download audio files, including MP3 music.¿¿¿-Simple & Powerful Voice Recorder¿¿¿One-key recording at any menu interface, push REC to start record, and havemore functions¿¿¿ such as A-B repeat, fast forward, fast rewind during playback, suitable for lectures, class, meetings,interviews recording.¿¿¿-Multiple Ways of Recording¿¿¿Support LINE-IN recording, Mobile phone recording, Internal dual stereo microphonerecording and External microphone can be inserted into the microphone interface for recording.¿¿¿-AVR Voice Activated Function¿¿¿Only recording loud enough decibels, auto-filtering low vioce, reduce blank segmentin recordings, effectively saving power and storage space.¿¿¿-Worry-free Product¿¿¿Only 50 grams and dimensions 12 X 33 X 101mm, portable recorder, comfortable to hold inpalm. 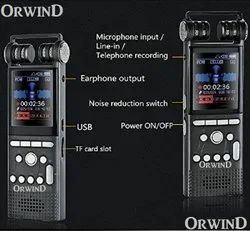 during product using, we free provide after-sales service and accurate technical support.¿¿¿-ORWIND VOICE RECORDERS: Come with 4GB/8GB internal memory in high-quality recording. Up to 142/284 Hoursof recording when setting at 32 kpbs recording quality, can insert extra micro SD card to Expanded space.PRODUCT SPECIFICATIONS: Unit Weight:50g | Unit Size: 12*33*101mm | USB Interface:MicroUSB2.0 | Memory Capacity: 8GB/ 4GB | Music Format:MP3/WMA | Recording Format:WAV | MultiLanguage: Support | Storage: Built-in 4GB/8GB storage | Operation Temperature:0 C°-40C | Voiceactivated Recording, Upto 55 Feet- Far Recording | Speaker:23(8Ω/1W) Double magnetic loudspeaker |Built-in rechargeable lithium battery/ USB powered | Recording Playback Frequency Response Range:200Hz-10000Hz. 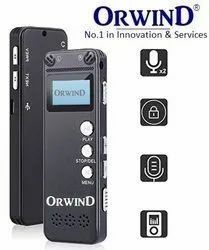 *AUDIO/VOICE RECORDING DEVICES*----------------------------------------------------------------------------------------------Further Information: If you require further information on the Product above please visit ourwebsite at www.Indiaboosters.com or contact us at the address below.Brand: ORWINDDistributed By: Orwind IncorporationLocation: Naraina Industrial Area, Phase-1,New Delhi-28, IndiaCare: +91 7777 001500Web: www.IndiaBoosters.com | www.Orwind.in© 2017 Orwind, Orwind Inc. & Orwind Incorporation.All Rights Reserved. Looking for Digital Audio Recorder ?